Macaroni Market seems to be turning into the hottest venue in Itaewon. Night after night as I walk past on my way home, the place seems to be packed with young, hip, trendy people and as I sat down for lunch the other day, the restaurant quickly filled up with patrons eager to sample their food. A new chef has just signed a two year contract at the Market and the menu has changed to suit his tastes. There's now a 20,000 won "Pure Beef Burger with Foie Gras" and the pasta menu has been filled out with a few new dishes. After my wonderful experiences with their titular dish, I thought I best try out their other baked pasta and so ordered the 15,000 won "Lasagna alla Bolonese". 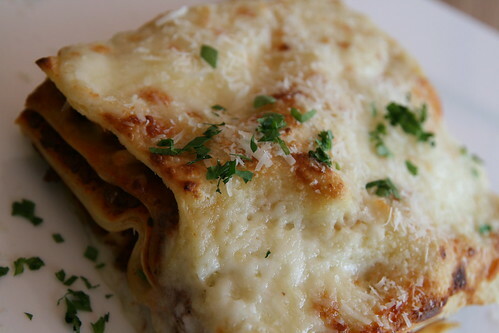 While the portion size is not as huge as the macaroni and cheese, this beautifully presented square of lasagna holds its own. The richness of the beef, mushrooms and tomato is complemented by just a single layer of bechamel sauce on top; the flavours are not overwhelmed by the cheese and I felt like I was being transported back to my parent's kitchen, eating my mother's own baked pasta. A small salad dressed with only oil and lemon compliments the main dish and the rosemary focaccia is a welcome addition for wiping up any leftover sauce. 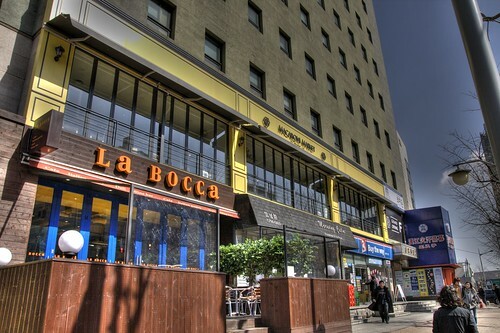 Downstairs at La Bocca a similar portion of delicious lasagna will set you back 25,000 won, but Macaroni Market have the edge with a much cheaper dish and a lighter, more enjoyable atmosphere.